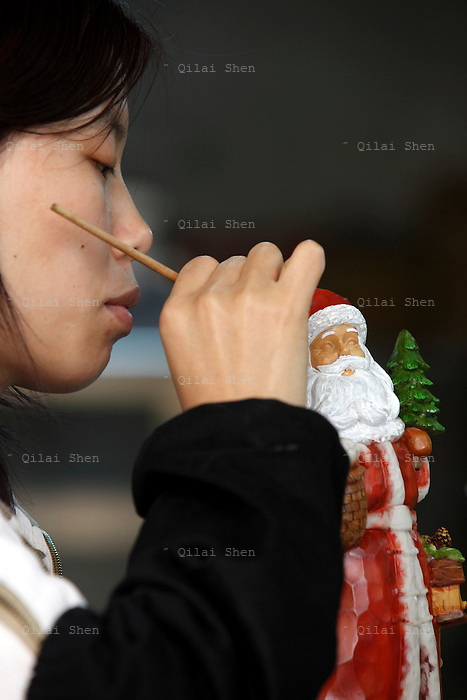 Workers make petroleum resin based gift items and garden ornaments at the Chuan Sen Art & Design Factory on the outskirts of Guangzhou, in Guangdong Province, China on 04 February, 2009. Orders at the factory, who sells almost all of their wares in North America and Europe, has declined drastically in the last two years.Workers make petroleum resin based gift items and garden ornaments at the Chuan Sen Art & Design Factory on the outskirts of Guangzhou, in Guangdong Province, China on 04 February, 2009. Orders at the factory, who exports almost all of their wares in North America and Europe, has declined drastically in the last two years due to the economic slowdown and western consumers' belt-tightening.Workers make petroleum resin based gift items and garden ornaments at the Chuan Sen Art & Design Factory on the outskirts of Guangzhou, in Guangdong Province, China on 04 February, 2009. Orders at the factory, who exports almost all of their wares in North America and Europe, has declined drastically in the last two years due to the economic slowdown and western consumers' belt-tightening.